Welcome to the Kessel Run where we bring you all the latest news and more from a galaxy far, far away! On this episode, Danny is on location at Star Wars Celebration 2017 in Orlando talking the latest news from the Star Wars: The Last Jedi panel, Star Wars 40th Anniversary Panel, and we catch up with some awesome cosplayers to get their thoughts on this spectacular celebration! Welcome to the Kessel Run where we bring you all the latest from a galaxy far, far away! On this episode I am joined by Heather from www.biteymadlady.com as we discuss Hayden Christensen’s return to Celebration after 15 years, ‘Kenobi’ rumors, our review of Rogue One, and the Fan Film of the Week! Be sure to follow us on Instagram, Facebook, Twitter, and SUBSCRIBE to us on YouTube – all @kesselrunweekly! New episodes every Friday and more on www.kesselrunweekly.com! 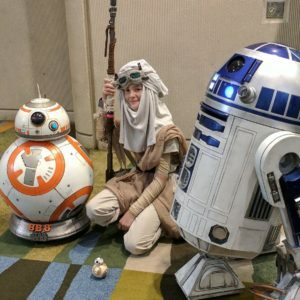 Welcome back to Kessel Run Weekly! This week we talk upcoming announcements from EA, Luke makes it to Tosche Station, and the First Order training gorillas? Also, we name the Fan Film of the Week! Welcome to Kessel Run Weekly where we bring you all the latest news from a galaxy far, far away in less than 12 parsecs! On this weekly episode we talk the possibility of Kylo’s fanboy road trip for Episode 8, the Rebels face their greatest threat in Thrawn, more Star Wars Celebration guest announcements, Funko joins in on the Celebration, and our Fan Film of the Week! Be sure to follow us on Instagram, Facebook, Twitter, and SUBSCRIBE to us on YouTube – all @kesselrunweekly! New episodes every Friday and more on www.kesselrunweekly.com!